The stunning new vehicle represents a statement of intent from the long-established County Wicklow headquartered family-run operation. We travelled to their well-appointed quarry in Blessington and met up with sales and aggregates manager Tom Hudson to find out more. 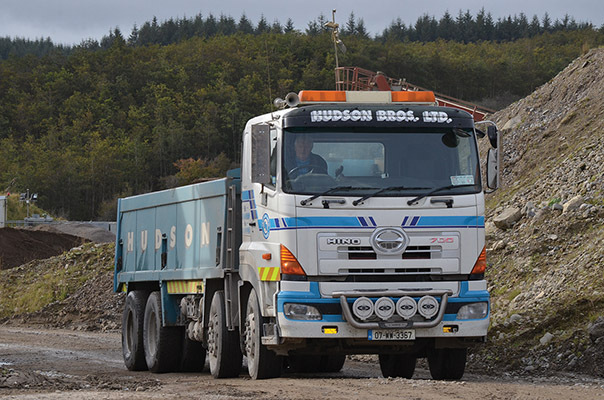 Hudson Brothers Ltd. was established in 1971 to supply raw materials to the civil and construction industries. During the intervening decades, the business has grown organically, providing products and service levels that are second to none. The state-of-the-art materials production facility at the company’s Phillipstown Quarry in Blessington, County Wicklow incorporates modern grading and washing plants for the production of sands and quality limestone pebble, while an immaculately-maintained in-house distribution fleet can meet even the most demanding of schedules. The Phillipstown site also boasts a static rock crushing plant, which is used to produce crushed graded materials from a sandstone source also at this site. Various grading and crushing mobile plant is also deployed throughout the quarry in addition to a large mobile fleet of dumpers and numerous excavators. 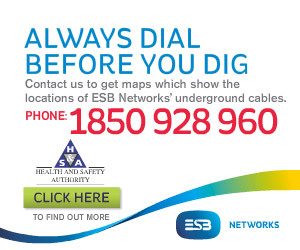 The range of building materials supplied to the civil engineering and construction sectors in the greater Dublin area includes aggregates (maintained to EN13242 standards), topsoil, washed grit sand, mortar sand, plastering sand, pit rejects and one-tonne bags. A fleet of eight trucks delivers materials from the quarry in the Garden County to sites in and around the capital. Up until recently, the fleet comprised Hinos exclusively but in early October, a brand-new 152-reg Renault C430 8x4 tipper was collected from Setanta Motors on the Longmile Road. Explaining the thinking behind the new acquisition, Tom comments: “Our fleet were showing signs of ageing, as we last purchased trucks in 2007, therefore its essential that we start to upgrade our fleet and the warranty offered with the Renault was something that nobody else could match. “Setanta gave us the opportunity to test drive a demonstrator truck which we found to be to our liking. We carried out a lot of research before deciding which one to buy and everyone we spoke to had great things to say about Setanta and the levels of service they provide. They came highly recommended and the four-year warranty means a lot. It’s a big investment but we are confident there will be plenty of work for the truck and we have the peace of mind in knowing that it’s covered by an unrivalled warranty and back-up. Including subcontractors, employment is generated by Hudson Brothers for a team of 30 people. All in all, Tom is confident that the future is bright for this long-running family operation. “We still have ample reserves of material, so there’s plenty of life left in the quarry itself,” he concludes. “We’ll continue to provide our customers with a good quality product and an excellent service to ensure we remain as a main provider to the market. Hudson Brothers Ltd.’s outstanding record for supplying the highest-quality and certified raw materials proves that this is most certainly the case!